Whilst Sister Terfatu remained in Addis Ababa we would not have the use of her truck that enables us to ferry items from the market. The yearly purchase of the grain and biscuits for the Day Care Centre was going to be an extra challenge. Luckily we had two of Sister’s helpers to haggle for the best price but the challenge of getting 1330 kilos of grain did appear to be difficult, added to this we also purchased 1000 kilos of sugar and 125 litres of oil. However two trusty donkeys with carts soon appeared and before we knew, it was loaded and on the way back to the storeroom at the Centre. By the time we got back from the market the cart owners’ two very wiry lads were already unloading the 100 kilo sacks, carrying the sacks individually, it is always amazing to see the strength of these guys. The cost of the transportation was £7. Sister Terfatu started to set up a barber shop for a young man, Takel, he is 20 years old and lives on his own and had a skill for cutting hair although he had had no formal training. His house would act as both his home and his place of work. Sister Terfatu had already bought him a set of clippers and we purchased a chair and a mirror for about £21. This will allow him to run his own business and hopefully build up enough clients to ensure that he will be able to support himself. A young lad, Grume Tigabu visited the Day Care Centre one day and was talking to one of Sister’s helpers, Largo, about his journey to school each day, 5 Kms in each direction. We got involved in the conversation and learnt that Grume was 17 and living with his cousin on the outskirts of town. 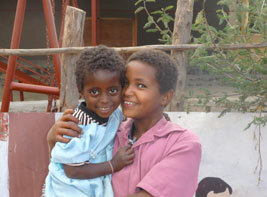 They had both come to Bahir Dar to get an education. Grume’s parents had died and he was now responsible for the small family farm 4 hours by boat across Lake Tana and then a couple of hours walk away. He goes home each weekend to look after the crops which he sells in order to pay his rent whilst in Bahir Dar. His neighbour waters the farm crops and keeps an eye on the farm during the week. During the conversation we had the idea of getting him a second hand bike which would help not only with his journey to school but his journey back to the farm each weekend. Bikes in Ethiopia are very expensive; Largo found a decent second hand bike for about £78. As is the way in Ethiopia several exchanges of papers were made and witnesses found then the money was exchanged and the bike along with a very substantial lock was Grume’s. When collecting the bike Grume gave us a letter of thanks as to how his life would be easier now that he has transportation. One of Sister’s helpers explained that there was the opportunity to have piped water into the homes for several houses in her area. This would be a basic tap with a pump but it would be a constant supply of fresh water. It has to be a collective of houses in order to keep the cost low. Again we felt that this was a project worth funding. Total cost £156. For most people one of the worst pains is toothache. Try to imagine having a toothache with no possibility of seeing a dentist and no money to buy painkillers. Well for one young girl this was happening. Elagwgnehu Goshow came to the Day Care Centre with her left cheek swollen to the size of a tennis ball. She had been like that for several days. We gave her £7.15 to go to the clinic where she received antibiotics for the apses. After a couple of days the swelling along with the pain reduced and she returned to the clinic to have the tooth removed. We did not ask for the full details of the removal but by the look on her face it was not a pleasant experience. The clinic did not give her any painkillers following the extraction; luckily we had plenty of painkillers to hand for her to take. As much as we dread the dentist the thought of not being able to go is unimaginable.